consider the advantages of giving up the bottle. Supplying fresh drinking water to your staff and visitors is good for productivity and it’s also required by law. 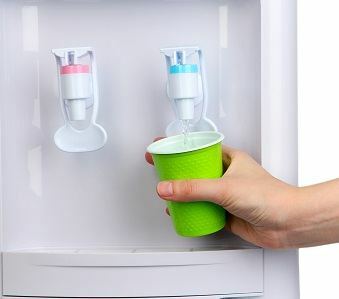 Most offices and places of business do provide water on their premises either with a bottled water cooler or plumbed-in water dispenser. But anecdotal evidence is growing to support the notion that plumbed-in water is a better choice. A bottled water cooler demands regular deliveries of new bottles, but once your plumbed-in water dispenser is installed the only expense is your general water bill. Depending on the size of your operation and staff, the cost of bottled water really adds up over the course of a month or a year. And you still have to pay that water bill for other uses like sinks and toilets. Bottled water coolers are susceptible to contamination from bottleneck handling during bottle changes, but plumbed-in water dispensers feature a sealed, airtight pathway that greatly reduces the risk of water contamination by completely eliminating the need for human contact with the water source. Water delivery companies sometimes use old plastic jugs that have been exposed to the sun and outdoor elements thus increasing their likelihood to leach chemicals into your drinking water. Plumbed-in dispenser system involves nothing more than the occasional filter replacement to ensure fresh drinking water. Whereas 10, 12 or 19-gallon water bottles are heavy and awkward, they require a great deal of storage space, they require more frequent cleaning and sterilization, and may leave you high and dry if there’s a gap between the time your last bottle empties and your next delivery arrives. Plumbed-in water dispensers purify mains-fed water directly from your building’s water supply, making it the most cost effective, energy efficient source of clean drinking water. Bottled water cooler providers use large vehicles to haul and deliver heavy bottles. Multiply that by the hundreds of vehicles plying the roads each day and the petrol required to do so and it is easy to see that bottled water makes a considerable albeit indirect contribution to air pollution.